You don't really need a long, drawn out explanation of these recipes, do you? I thought not. Melt 2 sticks of butter in microwave. Cut the other 2 sticks into 1" pieces, and place in mixer bowl. Add the melted butter to the soft butter and mix to a creamy consistency. Add cake mix and flour and stir until well blended. Dough will be soft; do not refrigerate, or the dough will be too firm to go through the press. Fill Cookie Press and press cookies onto ungreased cookie sheet or baking stone one inch apart. Decorate with colored sugars and press lightly to adhere. Bake for about 10-12 minutes, until firm but not brown. Cool 2 minutes on baking sheet, then remove to cooling rack. Preheat oven to 375°F. Beat butter on medium speed of electric mixer until creamy. Add sugar, egg and vanilla; beat well. Add flour, 1 cup at a time; mix well. Add food coloring, if desired, and mix well. Dough will be soft; do not refrigerate, or the dough will be too firm to go through the press. Fill cookie press with dough. Press dough onto ungreased cookie sheet or baking stone one inch apart. 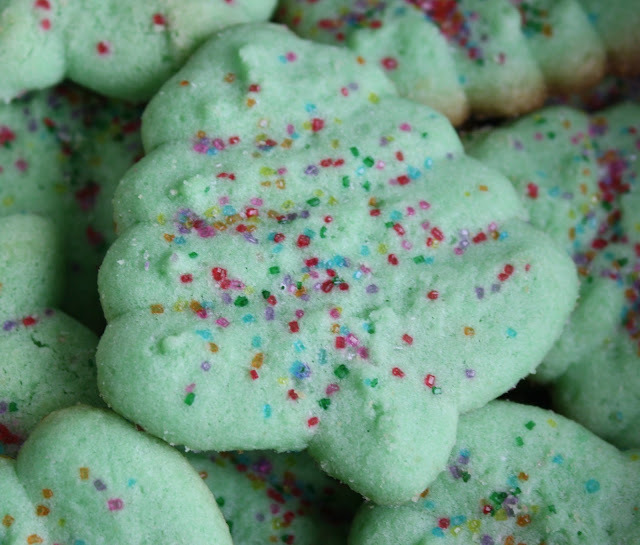 Decorate cookies with colored sugar or sprinkles, if desired, and press lightly to adhere. Bake 10-12 minutes or until firm but not brown. Cool 2 minutes; remove to cooling rack. Recipe says it yields 6-7 dozen cookies; I got 5 dozen using the Christmas tree. This loaf is a bit too brown. This is a bread I've tried several times and have never gotten just perfect, but I improve it a little bit each time I make it. I started using this recipe because a friend and I used to like the complimentary bread at Macaroni Grill. I have no idea whether they still serve it, as I focus on locally owned restaurants as a reporter for the Democrat and Chronicle. This is supposedly a copycat Macaroni Grill bread recipe. I found it online and have tweaked each time. Place yeast, sugar and water in large bowl or food processor and allow mixture to become bubbly. Mix in 2 cups of flour and the salt. Add 1 1/2 tablespoons of the fresh chopped rosemary. Knead for about 10 minutes by hand or in food processor about one to three minutes, until smooth and elastic. Add 1/4 to 1/2 cup flour as necessary. Oil a bowl, put dough in it and cover with a towel. Let dough rise in a warm place for one hour or until doubled. Punch down dough and divide in half. Let dough rest about 5 to 10 minutes. Spray baking pan or cookie sheet with cooking spray, or line with a Silpat or parchment. Shape the dough into two small rounded loaves. Sprinkle remaining 1/2 Tablespoon of rosemary and about 1/2 Tablespoon coarse salt on a small plate. Spray or brush the top of the loaves with a little water, then dunk the loaf in the rosemary and salt. Press lightly. Turn the salted sides upright and let rise again until doubled, about 45 minutes. Preheat oven to 400 degrees. Bake for 15 - 25 minutes, until lightly browned.